I sort of feel like uploading art. So, here's my latest. This looks nothing like what I saw in my head. It started off with a lot more birds (but I got lazy), and a lot more simple (the clouds and Kakashi snuck in there . . . . ) and . . . stuff. I don't even care that much about Sasuke's character. Um. But I end up drawing him, what the heck?? Photoshop, some hours . . .
Oh! And, they're training. That's the post-drawing explanation I came up with. Yup! Lol, yeah, it is pretty obvious, isn't it? XD I'm glad you like it, though! tis freakin beautiful. and a happy new year 2 u! ooo kakashi vs sasuke..id love to see the fight between them now in shipuuden..would be fun...but the pic is awsome..the birds.arent they sot of itachis technic or something like that? Really great job! 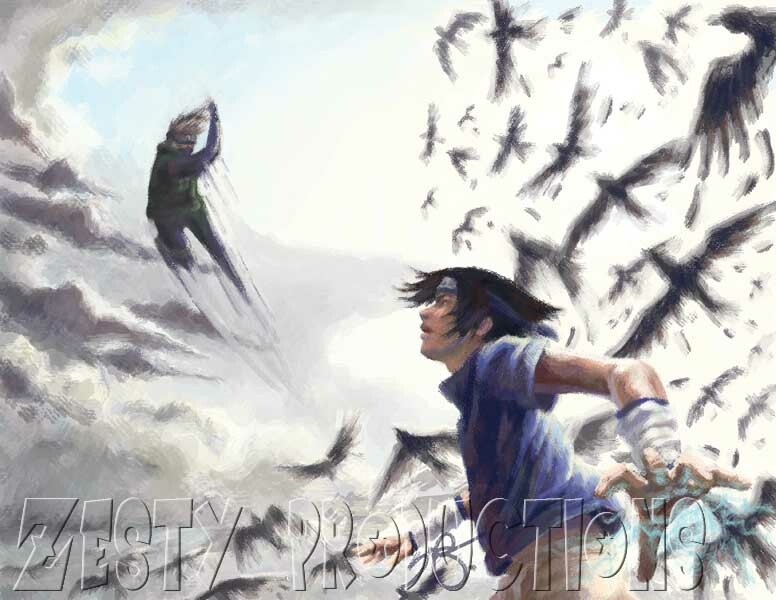 I love how you made all the birds around Sasuke. Thanks! There were supposed to be 1,000 birds around him (chidori, 1000 birds, get it get it??) but uh . . . I got really lazy. Lol.